There is a couple other rooms off the community room, a restroom and such, but we have looked around here long enough. Time to go back up to the main floor. Doorway and hallway where we entered. Up that small flight of stairs brings us to the main floor. To the right leads into the sanctuary, at least that is what it is called in Christian Churches. To the left is a study library sort of room. Ready to leave the Study/library. We will cross the hallway and enter the Sanctuary. If you look closely you can see our other host of the day sitting in the Sanctuary. We will introduce you to him in a few moments. In honor of a member of the Temple who died in a Plane Crash in 1945. As you enter the Sanctuary, if you were to make an about face this would be located on the wall on your right between the door jam and the back wall of the room. If you were let your eyes roam to the left of that doorway you would find this on the wall to the left of the doorway into the room. The plastic horns are called shofars. Traditional ones are made of rams horn. They are blown as part of certain religious services. Courtesy of Debbie Beck Lawlor. This was located along the back wall directly below the big window. That wall and window face Monroe Street. Te big window, back wall of the sanctuary, facing East or Monroe Street. 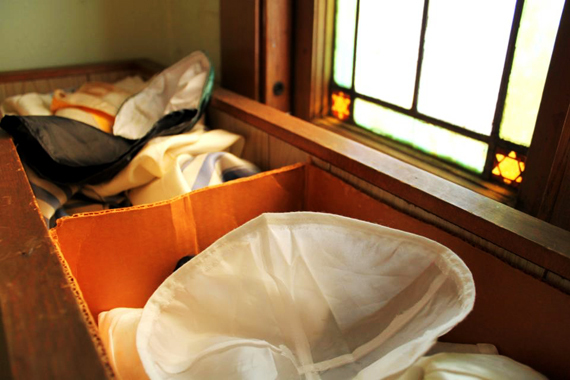 kippahs, This would be just inside the door, the northeast Corner of the Sanctuary. Courtesy of Jeff Langdon. This is the northeastern corner of Sanctuary. YOu can catch a glimpse of the Plaque Honoring the USN PIlot in 1945, and the small window where the box of kippahs are kept at its base. Looking directly across the room to the far wall. This would be the wall facing onto West 5th Street. The doorway there was one of the two main entrances in from W 5th Street, which is no longer used. We find the wooden floors nice. Looking towards the front or western wall. The outside of this wall would be facing the driveway to the front doors of the hospital.